Topsail Island Popcorn Factory is proud to offer a vast selection of flavored popcorn and additional flavors being added daily. Our Topsail Island, NC locally owned company also sells delicious frosted nuts such as pecans, almonds, cashews, and peanuts. We provide you a taste of old times with our selection of nostalgic candy, including Candy Sticks, Mary Jane, Bit-O-Honey, Chick-O-Stick, Salt Water Taffy, and many others. Whether you have a serious sweet tooth, or just want to enjoy some wild new popcorn flavors, we’ve got you covered! Sometimes it seems like all popcorn looks and tastes the same. That’s certainly not the case with Topsail Island Popcorn Factory, where we have over 30 flavors of sweet and savory popcorn. Among our flavors you will find all the classics including premium cheddar, premium white cheddar, butter, low salt, and caramel. If you are craving a little something different, you can explore flavors such as bacon, buffalo breath, creamy dill, BBQ, caramel with a chocolate drizzle, birthday cake, lemon pound cake, garlic parmesan, strawberry banana, and Barnacle Bill’s, which is our signature blend of caramel popcorn with a variety of mixed nuts. Once you have tried our Popcorn, treat yourself to delicious Frosted Nuts like Pecans, Cashews, Almonds and Peanuts. The Kids and the Kids at heart will enjoy our selection of candy too! POP in soon! 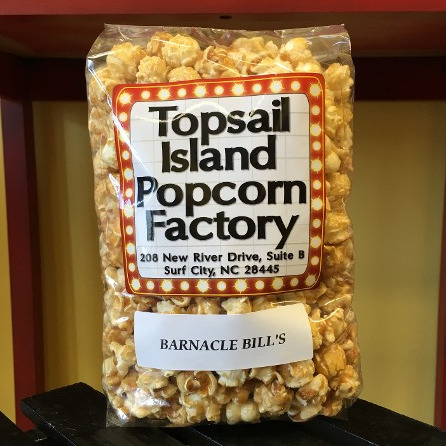 Here at Topsail Island Popcorn Factory, we put our more than 30 years of food service experience to work for you every day, delivering scrumptious popcorn and nostalgic candy products. Our founders started out after seeing the popcorn shops in other seasonal tourist areas and deciding they could do the same sort of thing in their own area. We want our customers to know that our popcorn is made fresh daily, on-site. After all, nothing is worse than stale popcorn! Two life-long residents of the island run our family company, which means that we genuinely care about our customers and about our company's reputation. 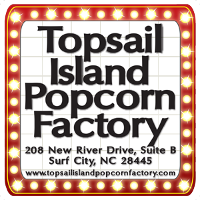 Topsail Island Popcorn Factory has a discount and loyalty rewards program, so be sure to ask us about it on your next visit.